If you are looking to increase your brand’s impact on Twitter, it is in your interest to know and use its advertising platform, Twitter Ads. Before dedicating your budget to this solution, however, you need to perform a detailed investigation the benefits of these kinds of ads. So, today I would like to tell you what advertising on Twitter can do to improve your brand’s results and ROI. The traditional way of measuring the ROI falls short when it comes to social media. Here, we find ourselves in an increasingly complex environment, where the consumer receives multiple impacts and it is difficult to pin down a cause and effect relationship. On the other hand, we need to act in real time to optimize our efforts to the best of our abilities, and make the most of the immediacy of social networks. If anything is sure, it’s that social media is extremely valuable when it comes to developing and reinforcing the relationship between brands and consumers, so it becomes important to update the way we look at ROI in order to adequately evaluate the benefits of advertising on Twitter. 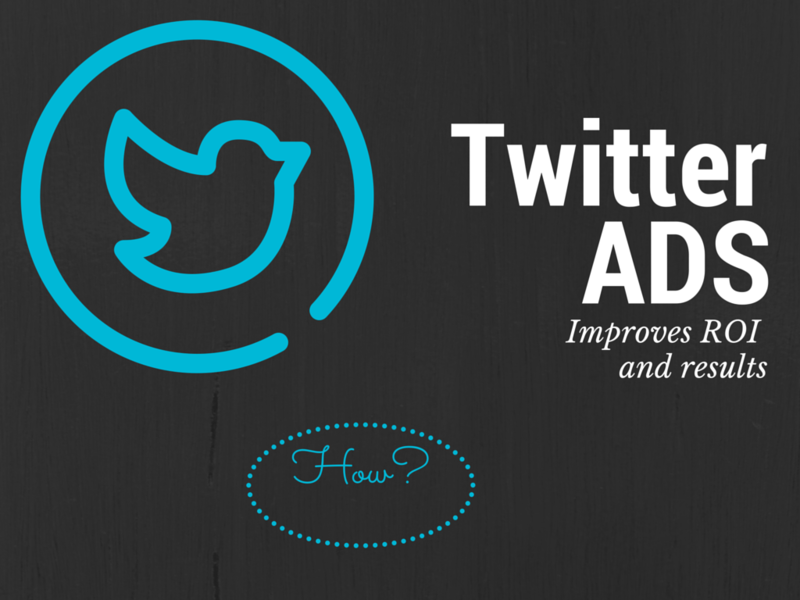 Did you know that 62% of users consider Twitter to be the quickest source of information? Just in Spain, this network has gathered 8 million active users. 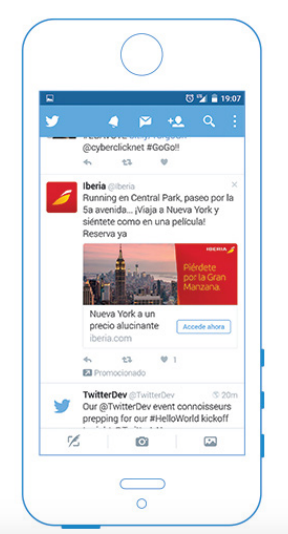 Advertising on Twitter allows us to reach out to this audience through promoted tweets. These tweets are marked by a small sign, but other than that blend in naturally to a twitterer’s news feed and can be commented, retweeted, liked… Long story short, they act like any other tweet, but have a much higher potential to reach out to people, and offer the possibility to add visual elements, like “cards”, to increase conversion. Followers. This is the option for you if what you’re working for is to increase your audience, but do not forget to interact with your new followers if you want to keep their attention. In this case, the payment method is per new follower. Website clicks or conversions. Allows you to direct traffic to you’re a website of your choice (don’t forget to optimize your landing page for mobile devices!) and follow metrics like downloads or purchases via conversion pixels. If you chose this type of campaign, you pay per click. Interactions. If you’re looking to make noise and gain popularity, this is your best bet. In this case, the payment is per user action: clicks, comments, retweets, likes, etc. Application Installations or Interactions. Advertising on Twitter is a great tool to promote you application, given 85% of the users on the network access it from mobile phones. Here you can chose between two payment methods: pay per visit to Google Play or the Apple Store, or per app install. Potential clients or lead generation cards. Lead generation cards allow you to create a list of users interested in your brand, without even having to leave Twitter. As leaving their name and email only takes a couple clicks, it is a great way to make your database grow. In this type of campaign, payment is per registered user. Video Playbacks. This form of advertising is still in its beta phase, but is expected to soon be available to all advertisers. It can be used to introduce video into Twitter campaigns and make the most of all the benefits brought by this format. It is paid for every time the video is 100% visible on a user’s timeline and has been viewed for at least 3 seconds. Personalized. This is a much more liberal type of campaign, as it has no defined objectives and is paid with each user action. Generally it is not the optimal choice, but can work for ads that do not fit into any of the abovementioned categories. In conclusion, the benefits of advertising on Twitter depend on the option you choose, but they include growing your community, increasing the number of visits to your website and conversions, stimulate interaction and popularity, incentive downloads of your app, increase your potential client database and promote your content via video. Whatever your objective may be, remember that segmentation is the key to creating a truly effective campaign. Here at Cyberclick we have investigated the best and worst actions to reduce your costs per action and per conversion in order to improve the results and ROI of your Twitter campaigns. Follow these recommendations to reach the maximum profitability of your campaigns. Use the power of the “now”. Start off your promoted tweets with words like “For only a few hours”, “Selling out”, “now” or “limited time”, as it creates a sense of urgency which moves the consumer to seize the opportunity before it’s too late. To promote discounts, use percentages instead of numbers. “40% off” generates more conversions that “50€ off”, although the actual discount might be exactly the same. Point out novelties. “New” is the magic word for your advertisements, everyone loves it. Offer the game of chance. Contests and raffles are another user magnet, so use them! Tweets with keywords such as “win”, “raffle”, “lottery” or “contest” are able to reduce your cost per action by up to 40%. Ask questions and do surveys. If your goal is to increase interaction, asking your audience is a highly effective resource. Use the new Twitter Polls (24hour lasting surveys) to incite virality. Use ecards to introduce visual content. Tweets including some form of multimedia have a 52% higher retweet rate and 313% higher interaction rate. Overusing your CapsLock. Don’t use them for more than 20% of your text of you will scare off your audience. Using hashtags in promoted tweets. Although hashtags are very useful to find the latest content and topics on Twitter, the truth is that they do not work well at all when it comes to the time for advertising. If you don’t want your campaign’s success to suffer the consequences, avoid them. Making your tweets too long. The most effective tweets are between 40 and 60 characters. Perhaps because they introduce another item to click on, and that distracts users, but the fact of the matter is that promoted tweets with mentions produce lower results. Ignoring your new users. If you have attracted new followers with your campaign, pay attention to them! In order for them to keep following you, you should answer all comments, be them positive or negative ones. To finish off, I would like to share with you some of the success stories of some of the campaigns we have developed here at Cyberclick, as sometimes theory is just not enough. There are few Spanish brands more popular than this airline, which has been active since 1927 and connects over 100 destinations all over the world. The goals of this campaign were to reduce the cost per search on their websites form, and gain more knowledge on the behaviour of consumers while purchasing, taking into account that we were focused on a mobile audience that then normally completes the conversion on a desktop. In the first phase we used a campaign to show always on messages (timeless), while in the second phase we united segmentations with real time offers to offer real time Ads, allowing us to show destinations and prices in a very dynamic way. As such, we created over 1000 active segmentations for geolocalized campaigns in Spain, including a large number of national, European and international routes. Since these ads, over 32500 visits to the campaign’s landing page have been generated, with a conversion rate of 49% related to the visit. GlovoApp is a service that puts consumers and local delivery services in touch with each other. At the moment, the company is looking to reinforce their position in the local markets of the most relevant European cities. As it is an app being dealt with, it was a fantastic opportunity to make the most of the mobile potential of Twitter Advertising. The daily app installs were multiplied by 5,36. 21% reduction of the CPI while the volume was increased. The brand’s engagement grew by 64,8% and the cost to achieve this result was reduced by 33%. These are just two examples of the amazing advantages for brands of advertising on Twitter, and I hope you are already getting excited about incorporating Twitter Ads into your marketing strategy! To read this article in Spanish, please click here!